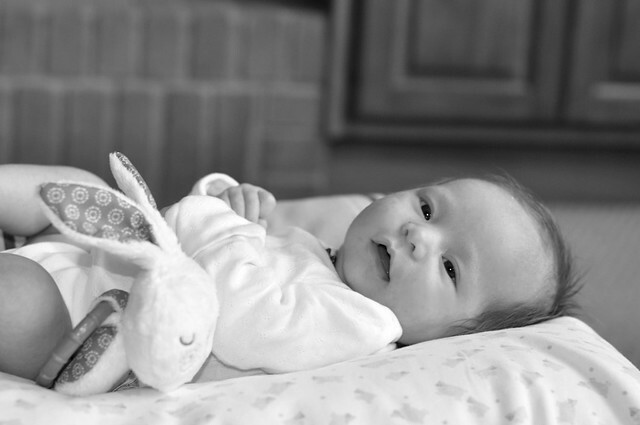 Six weeks ago, we welcomed baby Madelyn into our lives. Having a baby is a life-changing event. For the past 6 weeks, I've experienced all kinds of feelings from joy, fascination, and excitement to exhaustion. One day I wish I could be a stay-at-home mom and the next day, I can't wait to go back to work. The best advice I can give is to rest as much as you can and accept any help that was offered. For the first few weeks at home, I was happy that Madelyn slept so peacefully during the day. I was able to get everything done from doing laundry, cooking, cleaning, baking and everything else in between. By 7:00 P.M, I am dead tired. Since she slept so much during the day, she wanted to stay up and play at night(when my body and my mind desperately needed to go to sleep). Since I am still on my maternity leave, I offered to take care of Madelyn at night so everyone can get a good night's sleep. That didn't last very long. One night at 1:00 A.M, I broke down and asked my husband if he could take the baby before I lose my mind. Poor guy didn't know what happened because he thought things were under control. Lesson learned! Since then, we put together a “baby duty” schedule so both of us can have at least 4 hours of sleep each night. I am glad that we're doing/enjoying this together. In this fast-paced society, we are always in a hurry and there is never enough time in the day to accomplish all the things that need to be done. Sometimes, we forget to slow down and enjoy the little things along the way. It's still hard for me to see dirty clothes in the baskets, things are on the floor, no home-made meals every night. Although, I know I need to prioritize my chores and take care of myself first. That way I'll have the energy and cherish every single moment with my girls. A new baby can bring much joy, but it can also challenge you in ways you never expected. Despite all the hard work, this precious face is worth every effort. Awww congrats on the sweet bundle of joy! Love your blog posts!! Congratulations on your baby girl. I love all the tips you have given on this post. Congratulations on delivering baby Madelyn to this universe. She is every bit as beautiful and as angelic as you are, Sydney. Take good care of this angel. Indeed - rest and getting help is so very important. Because being too tired can be overwhelming, which leads to stress and other not-so-fun things. Glad you and the hubs are working as a team and able to enjoy all the little things. Madelyn sure is beautiful! Congratulations on your new beautiful baby girl. It sounds like you have a solid schedule in place and a wonderful husband who helps out! aw so sweet and what a sweet post. I think the first couple weeks is the hardest. i remember when hubby took k for the night so i can sleep for 6-7...i remember those 6-7 was like heaven!!! have a good weekend! She is so adorable, Syd. Very nice picture. Yes, motherhood is tough. Some kids are easier than others, but it's all relative. I can't believe you volunteered for night shift. lol. I had minor case of postpartum depression, I believed, when I had both of my kids. Now that I think about it, it was all caused by lack of sleep. When my boy was 2 years old, he was still not sleeping through the night, and wanted to play at 3 am every night. We took turns to deal with him. Even so, I got a case of lack of sleep depression and told my friend that I would put him up for adoption. I seriously thought I couldn't handle it any more. So all I'm saying I guess is that you are not alone, and what you are going through is normal. It will get better, and I wouldn't have had it any other way. Take care, and have a great weekend. Enjoy your little bundle of joy. Oh, and please don't ignore the older one. I hope Courtney is handling her baby sister well. She looks so much like you Sydney - absolutely gorgeous! Glad you and your husband have set a night routine together. Syd, Madelyn is beautiful! I see her cheeks are still as chubby as when she was days old :) Everyone I know who became a mother have all said the frustrating and tired times are totally worth it because motherhood is rewarding and like nothing else. Keep your head up, enjoy every moment. These days are going to go by faster than you think. Have you begun to notice and compare similarities and differences between M and C when they were both at this stage in their lives? Just curious to hear how their personalities and looks compare. Congratulations! She's precious! She will grow up very fast and won't want to be held or played with in the middle of the night. Therefore, when you rock her half asleep at 2 am, enjoy it. Enjoy her sweet scent, soft skin, and her need to have you hold her. Your fatigue, under eye circles, and tiredness will all go away but you will never forget how you loved holding your little baby and comforting her. I miss those days for myself and am glad I took it as a gift and cherished every moment, good and bad. Lots of love and blessings to you both! Baby Madelyn is a darling! Love to see her in this post. What you've just said are all the essence of motherhood.It's a mixture of joy and hardship. Glad that I have my insomia when my youngest arrived so I don'mind waking up late. You are in your adjusting stage on taking care of a baby after the first. It's right that you prioritize things so that motherhood won't come as a frustration but a rewarding feeling. You're so right about needing to communicate and come up with a schedule. I hope you continue to find rest. It really makes a huge difference in sanity, esp when dealing with the hormonal things going on. Congratulations again. She's so cute! She is so beautiful. Congrats Sydney! Great your husband helps you. I don't have any children yet but I can imagine it would be hard if you try to take care of them by yourself even only during the night. She is adorable! Hope things get better and better! Youre such a trooper for doing all these things you do! Thanks for sharing your honest and open experiences :) I too have a 5 week old baby boy and have gone through so many ups and downs since he was born so can completely relate to your post. I agree, the washing and cleaning can wait while you nurse and care for your little one but it sure can be hard to look at hehe Take care with your new addition to the family - make sure you rest lots!! She looks like such a beautiful little sweetie-pie! I think you captured motherhood perfectly in this post. Some days I feel like I want to quit and just be a SAHM and other days, I am SO thankful to get out of the house. Aw she is so precious and thank you for sharing her with us through this photo. It is overwhelming to be a good mother to our kids but when I think of how lucky I am to be one, i think it is all worth it. Congrats Sydney! She is absolutely precious!